Gun Survivor 2 Biohazard – Code Veronica is a light gun shoot ’em up set in the world of Resident Evil. Exit all the puzzles, spooky atmospherics and measured gameplay. Enter hordes of zombies, heavy firepower and short missions. 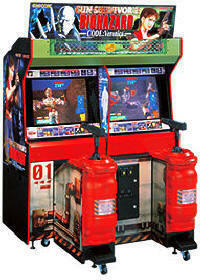 The arcade game was for two players, but it’s one-player only for the home version. Gameplay has the problematic controls of a first-person shooter, coupled with the on-rails limitations and oversimplified gameplay of a gun game. Lookswise, it’s pretty rough too. The monsters are borrowed from around the Resident Evil universe, but now move like they’ve got great big wind-up keys protruding from their backs. Walls and doors look crude and have almost no detail, and the whole thing looks worse than the first-person Battle mode you get for finishing Resident Evil Code: Veronica X. Scene one is the famous graveyard shoot-out with flaming zombies, and at first it seems to show some promise until you play it. It’s hideously unintuitive to steer and shoot with the light-gun, and it doesn’t help that your character is as graceful as a combine harvester. You can play as Steve Burnside or Claire Redfield, and the one you don’t choose accompanies you in your battle. But all the other person seems to do is mope around getting their neck bitten, occasionally firing the odd shot and generally doing their best to get in your way. You have a short time limit to get to the end of the five levels. Arrows point conveniently at the doors you need to go through and a simple map keeps you on course. Fail to do this and old turd-face himself The Nemesis turns up to chase you around.